After encountering John the Baptist, Jesus's work begins. He will meet many people; some will help him, many will need his help, and some will become his enemies. Jesus challenges the way people live, the way they relate to God, and the way Jewish law is enforced. Although he is a man of peace, he is not afraid to challenge authority, no matter where this might lead. What exactly are Jesus's responsibilities as God's son? How will he lead people towards a new relationship with God? How much can a man achieve in one short lifetime? How much more can he achieve by his death? 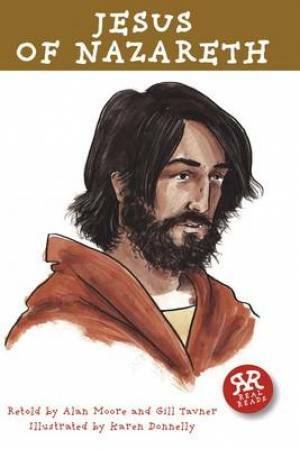 Jesus of Nazareth by Alan Moore; Gill Tavner was published by Real Reads in March 2010 and is our 42263rd best seller. The ISBN for Jesus of Nazareth is 9781906230241. Be the first to review Jesus of Nazareth! Got a question? No problem! Just click here to ask us about Jesus of Nazareth.